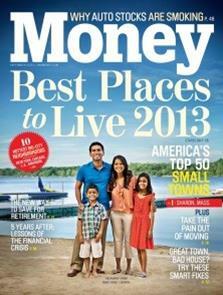 Windham NH, was ranked 30th out of 50 of the "Best Small Towns" in the United states by Money Magazine. They noted that Windham "attracts professionals who want to live near Boston (just 35 miles away) while enjoying New Hampshire's tax structure (no sales or income taxes) and quaint atmosphere." They also noted that, "natural beauty abounds" and mentioned the fact that the town offers waterfront living on Cobbett's Pond and Canobie Lake as being major attractions. Also mentioned was the 1,500 acres of conservation and recreation land. Windham with a population of about 13,599 people has a quite town center and very little commercial development. Money also noted the drawing power of Windham's new state of the art high school. We would add that Windham offers distinctive neighborhoods, with upscale homes at a fraction of the cost of the town and cities that surround Boston. Interstate 93, which is being widened to 3-4 lanes will provide better access to the city and 128 with scheduled completion around 2015. There is a town beach on Cobbetts Pond available to town residents a boat and canoe access toCanobie Lake. There is also the Windham "Rail Trail" that is an incredible community resource which connects many neighborhoods and offers walking and biking on about five miles of paved trail. Of course, the biggest attraction in Windham is the incredible people that reside in town. It is a place where you can easily become involved in the community.